projects that are part of principal trade corridors, where enhanced transit facilities and trade facilitation measures would yield maximum benefits from expanded trade/commerce. Good progress was made since November 2012, including (i) implementation of the SASEC Trade Facilitation Program loans/grants to Bangladesh, Bhutan, and Nepal; (ii) capacity building and knowledge sharing activities; (iii) mobilization of financial resources for trade facilitation; and (iv) performance measurement through the conduct of business process analysis. Support was given for the proposed SASEC Trade Facilitation Strategic Framework, setting out future initiatives in (i) Customs modernization and harmonization, (ii) standards and conformity assessment, (iii) cross-border facilities improvement, (iv) through-transport facilitation, and (v) institution and capacity building. 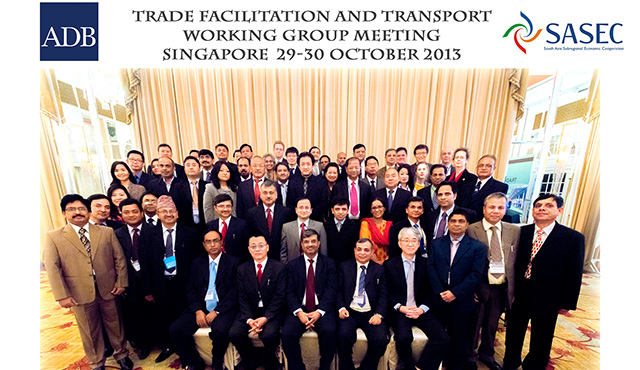 Delegates from the Governments of Bangladesh, Bhutan, India, and Nepal, led by Secretaries and Joint Secretaries of relevant ministries, participated at the TFTWG Meeting, together with staff and consultants of the Asian Development Bank (ADB). The heads of country delegations and Mr. Hun Kim, Deputy Director General, ADB South Asia Department co-chaired the various sessions of the Meeting.